I expect the worst from fox news, this is revolting even by their standards. Bolling Tweet: Obama Is "Chugging 40's" In Ireland "While Tornadoes Ravage MO." 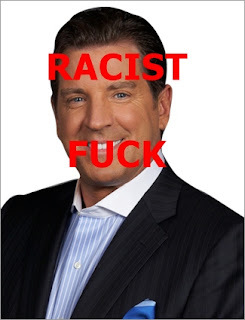 Promoting the May 23 edition of his Fox Business show, Bolling wrote on his Twitter feed: "Obama chugging 40's in IRE while tornadoes ravage MO. Very intense show tonight. Beck and Mike Gallager, Rep..."
Bolling On Obama's Budget Proposal: "Maybe" It Makes Sense "In Kenya, But Certainly Not Here. "Discussing Obama's budget proposal, Bolling stated: "How does increasing taxes count as spending cuts in your world, Mr. Obama? Maybe in Kenya, but certainly not here. This plan will amount to deficit increases, not reductions. It's a load of crap, and I'm offended that you think we're dumb enough to accept your math or your plan." If this were anywhere else you'd be waiting on the details of his suspension, but Fox News, where racism is the feature, not the bug. When you give a gift to someone and they don't accept that gift who gets the gift? In the end I think the only one bolling is hurting with his ignorant mouth vomits is himself; especially his credibility as a human being. It is right as an American to say whatever he wants. And, it is our right not to listen. He did make one good point about Obama though. I would proably trust his "math" a lot more if he was from Kenya as opposed to being an American.